The Milwaukee Brewers shut out the Los Angeles Dodgers 4-0 in game three of the MLB National League Championship Series. After the Brewers' vaunted bullpen stumbled in the first two games of the NLCS, Milwaukee needed a big performance from starter Jhoulys Chacin and they got it on Monday. 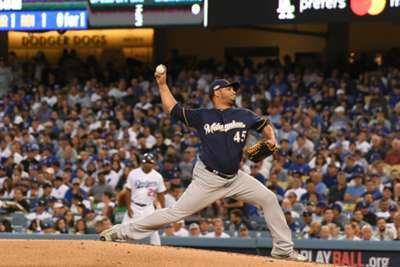 Chacin – a 30-year-old journeyman pitching for his sixth MLB team – went 5.3 scoreless innings to help give the Brewers a 2-1 lead in the series. Game four is at Dodger Stadium in Los Angeles on Tuesday. Coming into the NLCS, the Brewers' bullpen dominated talk about the team's pitching. Yet Milwaukee's starters have arguably made the difference in this series. In game three, the Brewers' unexpected ace Chacin stepped up with an unexpectedly good performance. The well-travelled veteran pitched 5.3 scoreless innings, yielding only three hits (with two walks) while striking out six. The right-hander does not have a commanding fastball, instead relying on a slider and changeup. Everything worked Monday against the Dodgers' powerful line-up. It was an especially notable performance, given Chacin entered the game with a 4.96 ERA in 11 career starts at Dodger Stadium. So through three games, the Brewers starters — or "initial out-getters" as manager Craig Counsell calls them — have allowed only one earned run and six hits in 13 innings. The bullpen, which laboured in the first couple of games, pitched 3.6 scoreless innings, although closer Jeremy Jeffress walked a tightrope in the ninth, loading the bases before retiring LA. Christian Yelich – the presumed 2018 NL MVP – had a hit in three at-bats and scored the Brewers' first run, but he has struggled otherwise in the series, with two hits and no RBIs in 12 at-bats. Several of the Brewers' big bats have been stymied by the Dodgers, including Ryan Braun (.167), Mike Moustakas (.182) and Jesus Aguilar (.222). Luckily, Orlando Arcia has been doing his best Yelich impression this postseason. The light-hitting shortstop (.236 batting average, three home runs during the regular season), gave the Brewers some breathing room and a 4-0 lead with a two-run homer in the seventh. It was Arcia's second homer of the NLCS, and third of the postseason. No one figured he would be a postseason hero, not with guys like Yelich, Braun, Moustakas, etc., around. But baseball's a funny game. Technically, game four is not a must-win for the Dodgers. They only trail 2-1 in the series. But lose either game four or five at home, and they head to Milwaukee needing to sweep two games. Not an easy task. So what is the blueprint for beating the Brewers? The Dodgers need to get to the Brewers early, and try to wear down their bullpen. Their big bats need to step up. The Dodgers were second in the majors with 235 home runs this season. They have two in this series. Game four would be a good time to get things rolling.